It’s a sad day when you finally realise at the age of 39 that you have no natural rhythm. This revelation has been a long time coming. It started way back in 1984 when my Mum sent me to disco dancing lessons in the school hall. I was a diligent dance student but there was no denying that although I knew all the moves, I couldn’t quite pull off a convincing performance of Freeze’s A.E.I.O.U. Similarly my attempt at jungle-themed disco dancing to Tight Fit’s “The Lion Sleeps Tonight” was underwhelming to say the least. I bought some leg warmers to see if they would help me dance like the kids from FAME - they didn’t. I tried a bit of shoe-gazing to the Stone Roses and Happy Mondays in the late eighties / early nineties and this, believe it or not, is how I bagged myself my then-boyfriend now-husband. The alluring combination of a miniskirt, purple tights, “ethnic” top and a half grown-out perm was too powerful for him to resist. 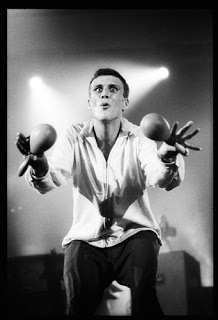 Luckily for me, he was too distracted by my unplucked Madonna-esque eyebrows to notice that I couldn’t really dance like Bez. Fast forward a couple of years to University and the opportunity of regular dance practice in various Newcastle nightclubs. This was the era of rave, whistles and gurning. I didn’t pull this off either. My gurning was too self-conscious (probably due to the absence of any drugs in my system) and I never felt confident enough to have a whistle. I resorted to the lowest of the low – dancing around my handbag and doing “lesbian style” dancing with my friends to try and hide the pitiful fact that I just could not cut it on the dancefloor. Luckily I am not alone in this world in not being able to dance. Most people I know are pretty awful at it. There are of course a couple of exceptions to this rule. My brother-in-law can rave beautifully and when I first knew him he could be prevailed on to do some breakdancing if you plied him with enough drinks. I have also got a couple of friends who can pull of a passable Beyonce routine without looking stupid (or like a fake lesbian). I don’t think I am being disloyal when I say that most women I know of my age now do the “Mum dance”. Thankfully our generation of men don’t often venture on to the dancefloor but if they did I am almost positive they would be doing the “Dad dance”. I don’t need to describe it – we’ve all seen it in action. So now I have three dance-mad children and all of them, yes ALL OF THEM, can dance. Even my four year old has better natural rhythm than me and IT IS NOT FAIR. Their favourite form of entertainment is to put LMFAO on MTV and order me to “shuffle”. Once again I have had to confront my dancing demons but with age also comes experience, so at least this time round I have worked out the root of my problem… I am suffering from a kind of dancing dysmorphia, whereby what I see and what other people see are two entirely different things. In my head I am doing a great “running man” with moves that MC Hammer would be proud of. The reality is somewhat different. When I showed my “shuffle” to my brother-in-law he started humming “Riverdance” because apparently it looks more "Michael Flatley" than LMFAO. My kids think it is the most hilarious thing they have ever seen. So I did what any other 39 year-old, mother-of-three would do; I searched YouTube for shuffling instructional videos (yes I am that sad). 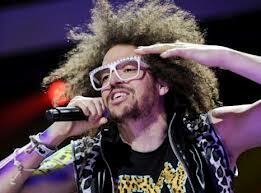 I was amazed to discover that LMFAO himself even has one. Problem number 2: I can see that the moves are really simple but I JUST CAN’T DO IT. I am the dance version of someone who is tone deaf. My dance gene is missing. The good news is that I am 40 in January and thereafter I can officially embrace middle-age and Mum-dancing with a clear conscience. My shuffling days are over (in public anyway). Dancing is destined be another one of those things I will never master along with tennis, drawing and being able to do a Cornish accent*. *Thanks to my husband for pointing this one out. Just browsing through your blog (love it!) and had to comment on this dancing business. I had an Incident in high school that scarred me for life: I was at a disco (we lived in Central America at the time) and, presumably because I'm tall and lurch around in plain sight over all the short, cute dancers, someone threw a lemon slice from their drink at my head. Horrifying. Your shuffle is unique Mel! It also brings a lot of smiles to peoples faces. You light up the room with your footwork.